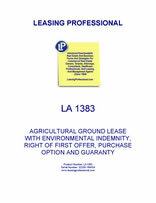 Other Features Tenant provides environmental indemnity to landlord during the lease term; lease contains an option to purchase a portion of the property in favor of the tenant; lease contains a right of first offer in favor of the tenant if the landlord want to sell all or part of the premises during the term; form contains a right to lease additional adjacent acreage if it becomes available for farming during the term. THIS AGRICULTURAL GROUND LEASE (“Lease”) is made as of _________________, (the “Effective Date”) by and between AGRICULTURAL PROPERTY LANDLORD, INC., a __________________ corporation (“Landlord”), and AGRICULTURAL TENANT, INC., a _________________ corporation (“Tenant”). A. Landlord is the owner of that certain real property located in _________ County, ___________, consisting of approximately ___ acres, more or less, as more particularly described on Exhibit “A” attached hereto and incorporated herein by this reference (the “ Property ”). B. Tenant desires to lease the Property from Landlord and subject to the terms and conditions set forth below, to manage and conduct farming operations on the Property. C. Landlord is willing to lease the Property to Tenant, subject to the terms and conditions set forth below. 1. Leased Premises. Landlord hereby leases to Tenant, and Tenant hereby leases from Landlord, upon the terms and conditions set forth in this Lease, the approximately _____ acres of real property described in Exhibit “A” , together with all improvements and structures thereon and all appurtenant rights thereto, including, without limitation, wells, pumps, motors, electrical panels, electrical hookups, water discharge facilities, pipelines, irrigation systems, easements, rights-of-way for ingress and egress, licenses and water rights and privileges (collectively, the “ Premises ”). 2. Term. The term of this Lease shall commence on the Effective Date, and end ten (10) years thereafter (the “ Lease Term ”). 3.1 Commencement of Rent Payments. As and for rental of the Premises, Tenant shall pay to Landlord annual rent (the “ Rent ”) in the amounts determined in accordance with this Section 3 , such Rent to be paid in equal monthly installments on or before the first (1st) day of each month. 3.2 Payment. All payments of Rent shall be payable in lawful money of the United States of America in immediately available funds, and shall be payable without offset, deduction or counterclaim except as otherwise allowed herein, and without notice or demand at the address of Landlord specified in Section 30 below or at such other address as Landlord may designate from time to time to Tenant in writing. 3.3 Amount Of Rent. Beginning on the Effective Date and continuing until __________, Rent will be due and payable at the rate of _____________ Dollars ($__________) per month (___________ Dollars ($__________) per annum). 3.4 Pro Rata Rent. If the Effective Date occurs on a date other than the first day of a month, Rent shall be prorated in such month on the basis of the actual number of days in such month. 4. Real Property and Water District Taxes and Assessments; Water Costs. All real estate taxes, assessments or similar levies of any kind and all water district taxes, assessments or similar levies of any kind levied against the Premises as of the Effective Date and assessed or falling due during the Lease Term shall be paid by Tenant. All such taxes, assessments or similar levies shall be prorated for Tenant’s period of occupancy. All taxes and assessments assessed against or attributable to improvements placed upon the Premises by the Tenant and Tenant’s personal property on the Premises, shall be paid by Tenant. The cost of water, together with any water standby or other charges, necessary for the adequate and proper irrigation of crops grown on the Premises shall be borne by Tenant. 5. Utilities. Tenant shall pay for all charges for light, power, and all other services and utilities supplied to the Premises during the Lease Term. 6. Water Supply. Any and all of Landlord’s rights to extract any groundwater beneath the Premises, use of any irrigation district facilities serving the Premises, and any future allocations of irrigation water from any irrigation district to which the Premises might be entitled during the Lease Term are hereby transferred to Tenant for the Lease Term. 7.1 Compliance with Laws. Tenant shall not do or suffer to be done on or about the Property, anything that would or does violate or conflict with any law, ordinance, rule or regulation now in force or effect, or that may hereinafter be enacted, promulgated or adopted by Federal, State or local authorities. 7.2 Waste. Tenant shall not commit or suffer to be committed any waste on the Premises (provided that, the use or application of pesticides, herbicides, sprays or other materials on the Premises or on any crops, in accordance with federal, state or county laws and regulations, shall not constitute waste). Tenant shall not maintain any nuisance on the Premises, and shall not use the Premises for any unlawful purposes. Landlord and Tenant acknowledge and agree that any and all deterioration of the Premises due to salinity, drainage and related problems or the use of the Premises by Tenant in accordance with normal and customary agricultural practices does not constitute waste or a nuisance or a breach of any of the terms of this Lease. 8. Use of Property. The Premises shall be used only for planting, caring for, harvesting, and processing (including freezing and storing) of crops and for other incidental uses. In so doing, Tenant will comply with all requirements of law and governmental regulations thereunder. 9. Department of Agriculture Rules and Regulations. Tenant shall have the use of any contract acres, crop base, yield, history, allotment and other farm program attributes allocated to the Premises, and Tenant may farm the same in combination with any other real property of which Tenant is the owner or operator, provided that such use shall at all times conform to the rules and regulations of the U.S. Department of Agriculture (“ USDA ”). Landlord shall execute such documents as may be necessary in order to combine the Premises with such other property into a single farm unit for USDA purposes. Landlord disclaims all representations and warranties as to the contract acres, crop base, yield, history, allotment and other farm program attributes allocated to the Premises. The parties agree and understand that at the expiration of the Lease Term, all of the contract acres, crop base, yield, history, allotment and other farm program attributes allocated to the Premises as of the inception of this Lease shall revert to Landlord. 10. Environmental Indemnity and Covenants. 10.1 Landlord’s Representations and Warranties. Landlord represents and warrants, to the best of its knowledge, that any handling, transportation, storage, treatment or usage of Hazardous Substances (as defined in Section 10.6 below) that has occurred on the Premises during the period of its ownership has been in compliance with all Environmental and Safety Requirements (as defined in Section 10.5 below). Landlord further represents and warrants that, to the best of its knowledge and belief and except as otherwise disclosed to Tenant in writing, any currently known Hazardous Substances which might be present above, on, or beneath the Premises do not exceed those concentrations which would violate current applicable laws and regulations. 10.2 Landlord’s Indemnity of Tenant. Landlord hereby agrees to indemnify and hold harmless Tenant from and against, any and all losses, costs, claims, or damages to the Premises or suffered by Tenant resulting from use, generation, manufacture, production, storage, release, discharge, or disposal of Hazardous Substances on, under, or about the Premises which are caused by Landlord or occurred prior to the commencement of this Lease. Further, Landlord assumes all liabilities for any clean-up, remediation, and/or restoration costs which result from such use, generation, manufacture, production, storage, release, discharge, or disposal of Hazardous Substances which are caused by Landlord or occurred prior to the commencement of this Lease.